WESTERN Queensland grazing identity Michael Gibson and family have paid $15 million for the large-scale mixed grazing and cropping enterprise, Darran Aggregation, in the state’s south-west. The three adjoining landholdings, comprising 5054ha Darran, 1246ha Beardie Lagoon and 5795ha Brookdale, offer 27km frontage to the Balonne River, close to St George. A feature is the 512ha irrigation areas underpinned by a 470ml water licence from Balonne River, supplemented by 3700ha of dryland cultivation. The 7884 hectares of grazing country features extensive stands of native and improved pasture including buffel, creeping blue, Mitchell grass and medics. New owner, Mick Gibson and family plan to use the properties to background cattle for domestic beef programs. “We supply a lot of cattle to Coles. Over recent years we’ve had trouble getting cattle heavy enough due to the dry conditions,” Mr Gibson said. Gibson Grazing runs 73,000 head of cattle (including a 28,000 head breeder herd) on 11 properties spanning more than 2.4 million hectares in Queensland and the Northern Territory. 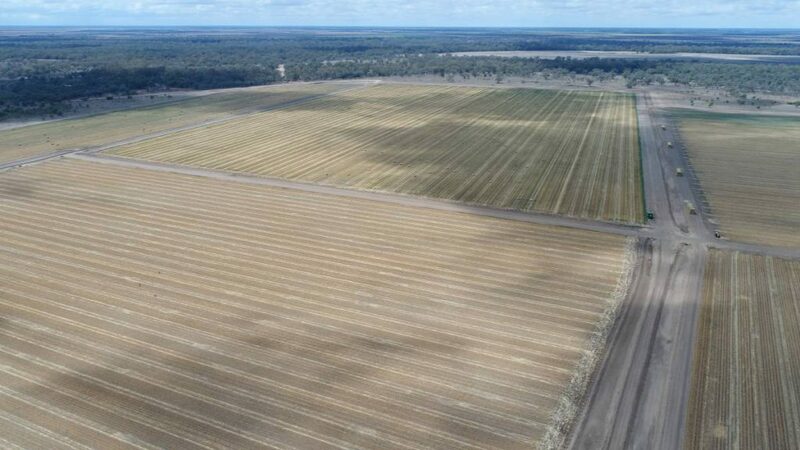 They include properties at Thargomindah, Quilpie and Boulia, as well as a backgrounding operation at Bollon; 3500ha of farming and cropping country producing wheat, barley, sorghum, corn, mung beans, chickpeas and cotton; the 4000ha Olinda Park feedlot at Dalby; the 6879sq km Manners Creek Station, north-east of Alice Springs. It also breeds bullocks for the export beef trade on the 10,700sq km Bullo Downs in the Channel Country, in Queensland’s south-west. After two decades of ownership of the Darran aggregation, vendors the Lindores family decided to change direction in October last year and offer the parcel as a whole or in separate lots via expressions of interest closing on November 29. CBRE’s Simon Cudmore said the diverse enterprise attracted widespread domestic and international interest. “Inquiry came from family-scale enterprises to corporates, including locals adding to existing operations, and institutions looking for significant scale in backgrounding or breeding,” he said. “The mixed nature of Darran is one of the major highlights of this aggregation -offering cattle and sheep production, irrigation and cropping – it is truly a mixed enterprise of significant scale,” Mr Cudmore said. A parcel of three properties located in the heart of western Queensland’s Darling Downs, attracting tremendous interest, will go under the hammer next week. Wongalea Farm and feedlot, Ramona and Topwater have been owned for many years by David Campbell and family. David has decided to wind back and semi-retire, retaining a fourth property which he part owns with his brother. The three properties are in close proximity and situated in the sought after, but tightly-held Condamine region. Spanning 5841ha, they deliver multiple income streams from grazing, cultivation and feedlot, together with secured and potential lucrative coal seam gas agreements. Combined, they have the capacity of running more than 2000 backgrounder cattle, 1000 feedlot cattle and cultivating 328 hectares of prime deep soil brigalow/belah country. Marketing agent Kevin Graham from Kevin Graham Consulting said while many had battled through the worst drought in memory last year, the three properties had performed strongly, yielding solid tonnage figures in wheat and barley, silage and excellent condition in the cattle. To date, Mr Graham has fielded 55 enquiries and conducted 22 inspections. “Demand is widespread – local, interstate and overseas, corporate and family farming operations, as well as neighbours. Some are interested in purchasing the properties as a whole, while other parties have expressed interest in Wongalea as a standalone,” he said. A total of 55 inquiries and 22 inspections have been held for a Condamine region aggregation going to auction next week. “Better grazing country in that part of the world has been making around $2500/ha, while cultivation country is making around $3800/ha. These three properties will fall into that category,” Mr Graham said. Abundant water supply, value-adding through the feedlot and opportunities in the gas industry provided solid, long term returns. The aggregation (including extensive plant and equipment, but no stock) will be auctioned next Thursday (February 14). If they are passed in, Wongalea will be offered as a stand-alone.